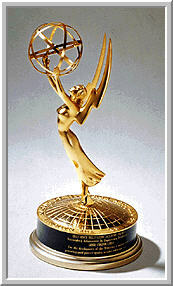 Here’s a complete list of all the winners from the 2007 59th Annual Primetime Emmy Awards. But Yay for Greg for winning best writing. I love the writers on the show as well so this was a good win. You know what? There has never been a funnier character than Dwight on television, and Rainn Wilson is the reason he is that funny. I’m sad for Jenna and Steve, but the show and Rainn were robbed! All you 30 Rock haters should watch the whole season – although it’s nowhere near as engrossing as the Office, it’s at least as funny. And probably better-written. More of an Arrested Development-style show then you’re likely to find on TV these days. I am actually really happy; here’s to hoping this keeps 30 Rock on the air for at least another season. As long as 30 Rock or The Office won best comedy, I was going to be happy. I was absolutely shocked Katherine Heigl won…not in a bad way, it just surprised me. Her speech was cute. As much as I love Steve, Ricky Gervais is brillant. I was happy to see him win. I am upset BSG didn’t win any awards, boo! And I’m still upset FNL wasn’t nominated for anything!! I was so disappointed this year. I think that the Emmy’s were a complete bomb. I was so sick and tired of seeing the same 3 other television shows names on the screens behind the presenters and winners, infront of the audience in the back. And for them not to broadcast from each side of the stage, alternating microphones, was just terrible. If you weren’t in Desperate Housewives, The Sopranos, Ugly Betty, Grey’s, and maybe Heroes, you and your show were NEVER seen. I never saw anyone from How I Met Your Mother, any of the CSI, only a blink from The Office, and a lot more people that I would loved to have seen. The best parts were the cast from The Office; even though they got completely screwed. I was surprised that Greg Daniels won for Gay Witch Hunt, and think Michael Schur was going to win for The Negotiation. I don’t know if The Office submitted their best episodes for this year; however, Rainn and Steve should have definately won. I am shocked that 30 Rock won for best comedy and that should have also gone to The Office. The “tribute” to The Sopranos was really odd. I saw nothing about that performance as a tribute; even though I love Jersey Boys as something completely different. If we could actually see the clips in the background, or if The Jersey Boys changed the lyrics of the songs to mention The Sopranos, then fine. I did not think that they should have won for best drama. And the clip montage from the late night shows was strangely placed WITHOUT JIMMY KIMMEL! How could they not have him in that montage. And for it to just segue from one liners to a touching tribute to Tom Snyder was just so out of place. It was just at the wrong time. My other disappointment was when Forest Whitaker did not win for his BRILLIANT performance on ER. When I watched that, I knew he should have won – it was nothing that I had ever seen before. I love John Goodman in his own right; however, Forest had it hands down. I don’t know if the people who had the final vote were actually lucid during their initial and final voting process, because a lot of the quality programs were not initially nominated and a lot of the programs that should have won did not. I didn’t even think they announced the winner for the best guest actor, I had no idea that John Goodman won it. They only called up the winner for the best guest actress to present. I just assumed the actor that won wasn’t there, but I was like, “Hey, aren’t they at least going to say who won?”. Also, weren’t Mia Michael and Wade Robson nominated for something for SYTYCD? They didn’t announce their catagory or who the other nominees were and if they won or not. GMMR – Do you have that info? If you do can you post it. I’d really like to see if SYTYCD was recognized for something, it’s such an amazing show. Why it wasn’t nominated in the best reality competition catagory instead of Dancing with the Stars is beyond me. The show is so much better. I’m very dissapointed that The Office didn’t get more recognition. When they announced Jeremy Piven’s name for the second year in a row, I couldn’t believe it. Not that I don’t love Ari, but I don’t think it’s fair to compare a show on HBO which can say or show anything they want to, to network show that it so limited. The Office does push the envelope sometimes (The S3 DVD commentaries had a lot of, “I don’t know how we managed to get that on the air.” type of comments) but Entourage uses straight-out profanity and goes the easy laugh. The Office has much smarter writing and has to do it in a much cleaner way and it always comes out way funnier. I don’t find myself laughing out loud when I watch Entourage. I don’t really laugh that much at 30 Rock either. I find it has much more slapstick humor and it really doesn’t appeal to me as much as The Office. I think it has to do with Tracy Jordan, he’s just too over-the-top for me. Also, where was he? He didn’t go up to accept the Emmy with the rest of his show and I didn’t see Alec Baldwin go up with cast either and I didn’t see him in the post-show interviews on E!. I though that was kind of strange. As soon as I saw that The Office cast wasn’t placed near the front and weren’t mentioned in any of the opening numbers, I had a feeling they weren’t going to be winning as much as I would have liked them too. I’m happy for Greg Daniels and I loved his acceptance speech. I thought it was the best one of the night and I was so ticked off when the music man cut him off.